This work invites us to rethink the reality inherited from the digital revolution and its social, cultural, and political implications. The author designed a computer vision system whose originality lies in the fact that it is applied to computer themselves rather than humans. In other words, while the system’s artificial intelligence watches selected clips from classic films like 2001: A Space Odyssey or Taxi Driver, a motley assortment of lines appear on the screen that map the places toward which the computer directs its gaze, synchronized with the original soundtrack. This slightly ironic project recalls the classic theories of machine consciousness in line with some of the earliest works to explore the convergence of art and artificial life. The prize includes a cash award of 12,000 Euros. VIDA was founded by artists Rafael Lozano-Hemmer, Nell Tenhaaf, and Susie Ramsay, and is supported by Fundación Telefónica out of Barcelona. This year’s jury members were Honor Harger, Jose Carlos Mariátegui, Marina MacDougall, Mónica Bello, Nell Tenhaaf, Roger Malina, and Laura Fernández Orgaz. Mónica is also VIDA’s artistic director. 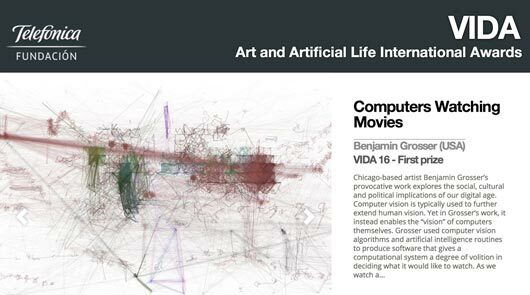 I am tremendously grateful to VIDA, the jury, and Fundación Telefónica; I will use the prize money to develop my next large-scale AI-related artwork. I also want to acknowledge the work of the other finalists, including second prize winner Cecilia Jonsson.